Anyone struggling to balance their finances these days is going to find themselves at a loss for an excuse. All the money managing, counting, and advising apps floating around can be beneficial, sure, but the sheer volume both in design and function makes picking the perfect one for you a daunting task. 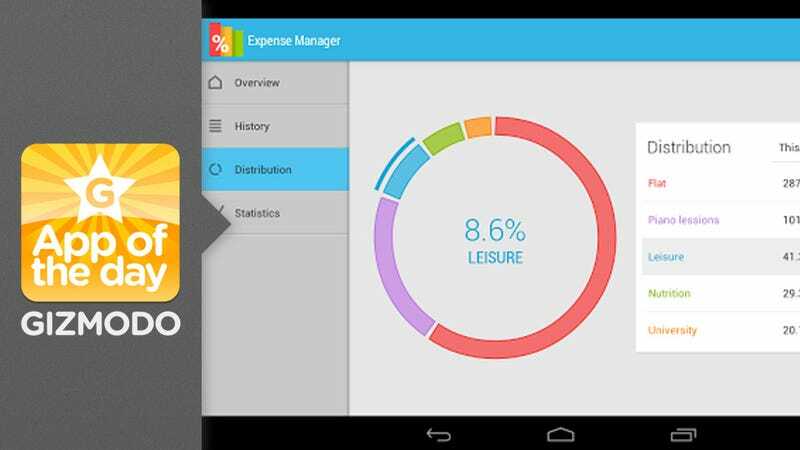 Expense manager, though, is a clean, beautifully designed app that breaks through the clutter to make keeping your accounts in a line a pleasant—and dare I say enjoyable—experience. Gives you five, basic sections with which to finally give you a sense of control over your spending. On opening the app, custom budgeting categories give you an immediate overview of how much you've spent this month, what you've been spending it on, and how much of your monthly allotment remains. The history screen gives you a glance of your entire spending past, which you're free to filter as you like, while the distribution page visualizes your spending for that specific month in pie chart form. The final screen offers your stats over varying periods of time, so you can see how you're spending habits have improved (or not) months or even years at a time. No one likes budgeting. But Expense Manager makes the whole process as painless as possible with a clean, simple UI—something that really can take at least a modicum of stress out of the process. Friendly animations take you from screen to screen, and the entire experience is highly customizable, letting you mold your restrictions precisely to your liking. One of the best parts, though, is that it tries to take on at least some of your work. You can set daily entry reminders that will gently pester you to input whatever expense you might repeat at a set interval. Unlike apps such as Mint, though, you will have to input each expense as it comes, since Expense Manager does not sync with your credit cards or bank account. For those with security concerns, though, that may just sweeten the deal.